This easy holiday wreath will greet your guests with a sparkle. Oooooh sparkly sparkles oooh. I love sparkles hehe. All items I used are from my local Dollar Tree store for a total cost of $9. It took me about 2 hours to put this together but that was with me talking to a friend and fiddle farting around LOL. I bet this would take under 45 minutes if you focused exclusively on it. If you can wield a hot glue gun without burning yourself too bad then this is the craft project for you. I've seen quite a lot of these wreaths being made on other sites. Everyone has their own way of doing this but I found my way works for me best plus I adore any craft that needs a glue gun! 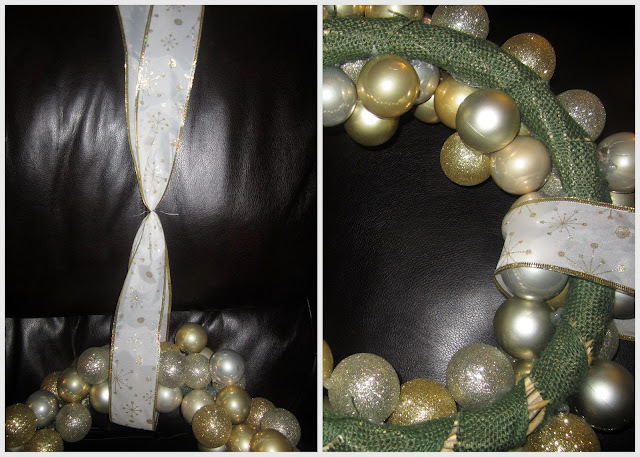 The one thing that stood out to me was how perfect other wreaths were. My personality is rather random and that is how I like to craft so perfect would not do. The all over random placement of the Christmas bulbs makes this more eye appealing in my opinion. It's interesting how the balls look like different sizes but really they are all the exact same. I chose gold and a silver/gold color because it ends up looking classy plus it matches my door and sparkles in the sunlight. Any color will work and any size bulb too. All that matters is if you like it right? I still need to glue 1 more ball onto the top left side. Somehow 1 ball was over looked and I just found it. Have fun crafting! If you are a blogger and have a beautiful holiday themed craft or recipe to share I invite you to post to my linky at the very bottom of this post. 4. 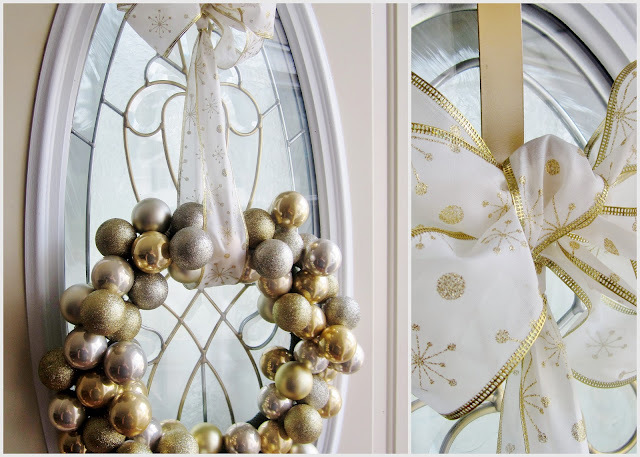 Once everything is cool wrap the wide ribbon around your chosen space on the wreath and then secure with a wire from the door hanger package. Twist the ends into a big triple looped bow and use the other wire from the hanger package to secure it. 5. Hook over your door and enjoy! Happy Holidays! ETA 11/16: Check out another version for $1 more is in the post before this one! Don't forget to enter my $60 Holiday Butterball Turkey Giveaway! This is open to US residents only, no PO Box addresses, must be 18 and older and only 1 entrant allowed per household. There will be 3 winners. Giveaway will end on 11/19/2012 at 12:01 am EST. Giveaway is now over. Look for more in the future!